Clip On Earrings Please Note: How well a clip on earring stays on your ears varies greatly depending on the thickness of your earlobes. Arte Designs is not responsible for earrings that are lost or damaged as a result of the clip-on sliding off your ear. These sterling silver clip on earrings can be purchased with a pair of Arte Designs earrings and we'll convert them free of charge or they can be purchased "As Is" if you prefer to convert them yourself. Slightly over 1/2 inch long. Convert earrings or send "As Is"
Yes, convert earrings to clip on. No, send clip on "As Is". Clip on earrings are now available at Arte Designs. I can convert most of our handmade earrings into non-pierced clip earrings, with exception to our solid hoop styles. 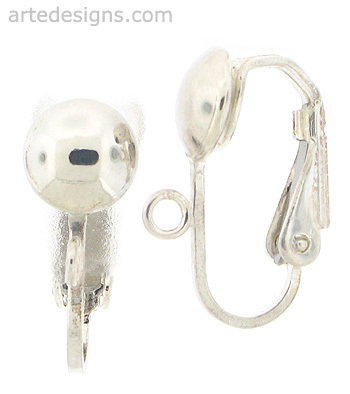 These ear clips are available in sterling silver, gold plated, or nickel plated.